Hi All! 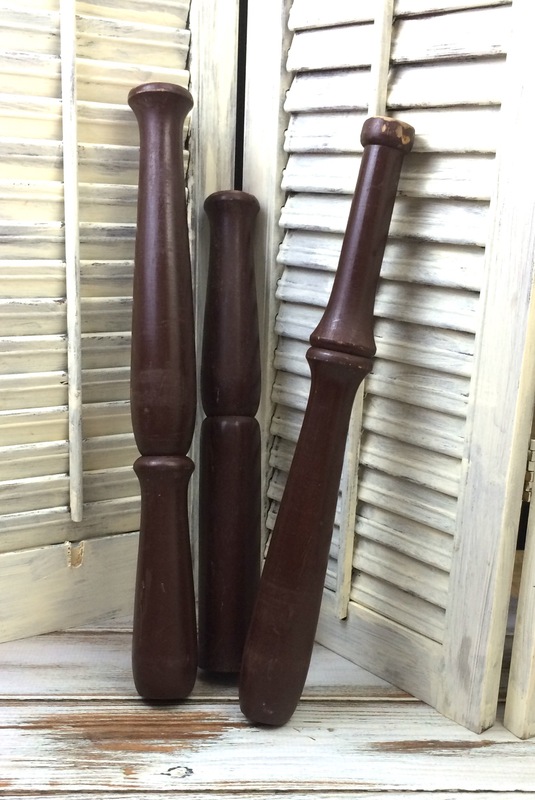 I am so excited to be showing you a fun project made out of wooden spindles. My Spindle Firecrackers, and they are so easy to make, and super cute! 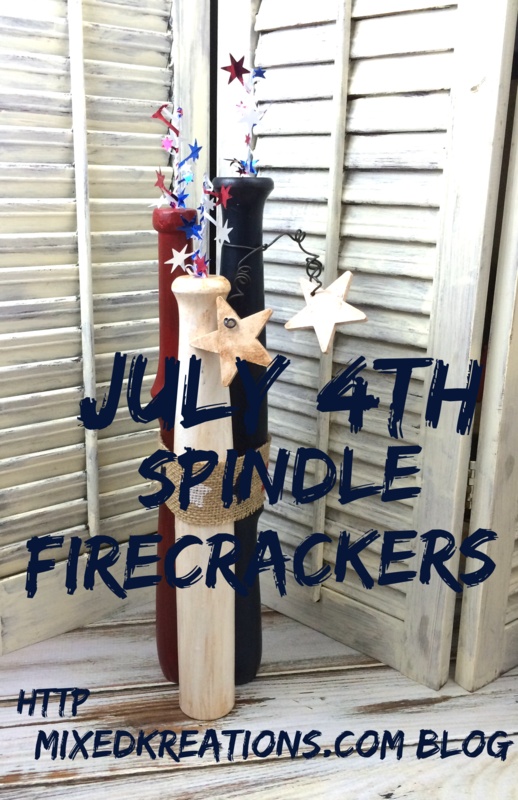 These July 4th spindle firecrackers were repurposed from some of my spindles that I picked up at a garage sale. They would be a fun project to make for celebrating July 4th, or any other Patriotic holiday. First off you need some wood spindles cut at three different lengths. 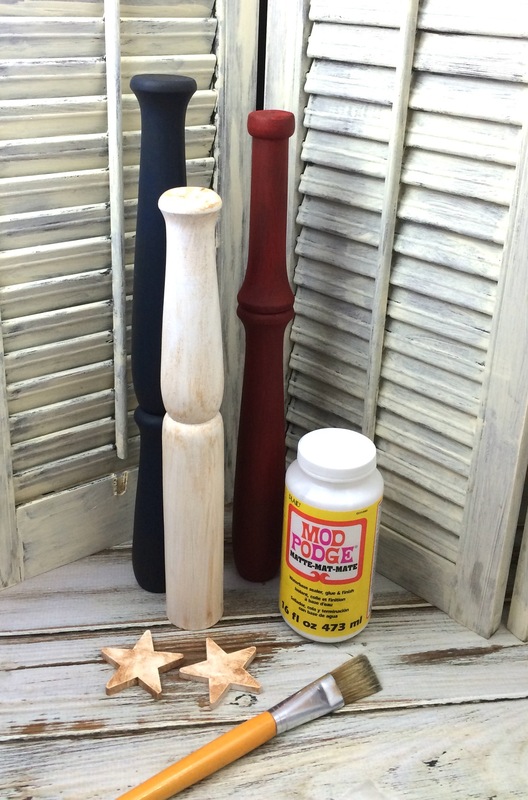 Give the spindle, and stars two coats of paint drying throughly between coats. 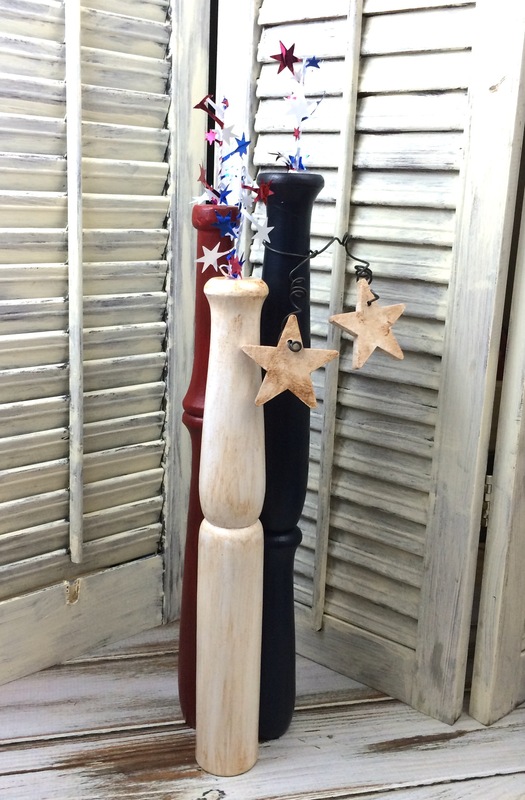 Now add antiquing gel to each of your July 4th spindle firecracker, and wipe off excess to get the look you desire. Drill a hole in the top center of each spindle firecracker. Drill a small hole in each star large enough for your wire to go through, and connect both stars on each end of your wire. 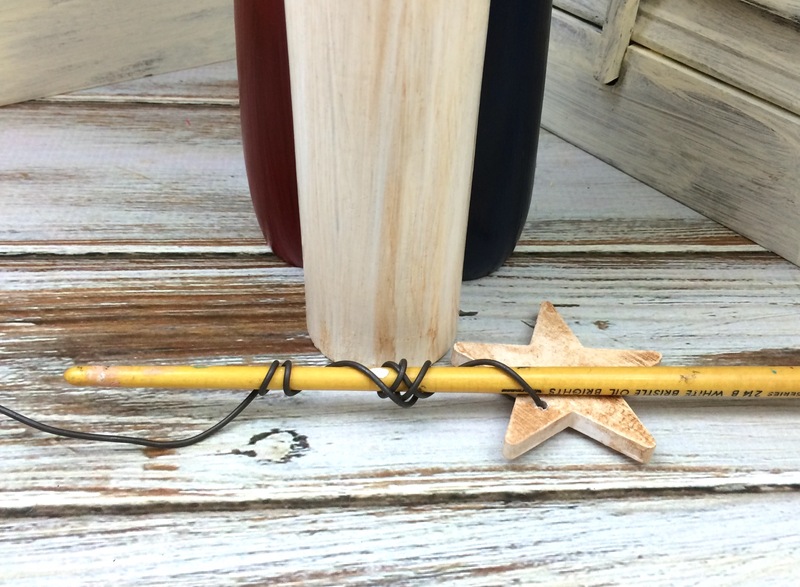 Flip your stars over and wrap the wire closes to the stars around the end of your paint brush. Leaving the middle 3″ section straight to twist around the neck of your blue spindle firecracker. 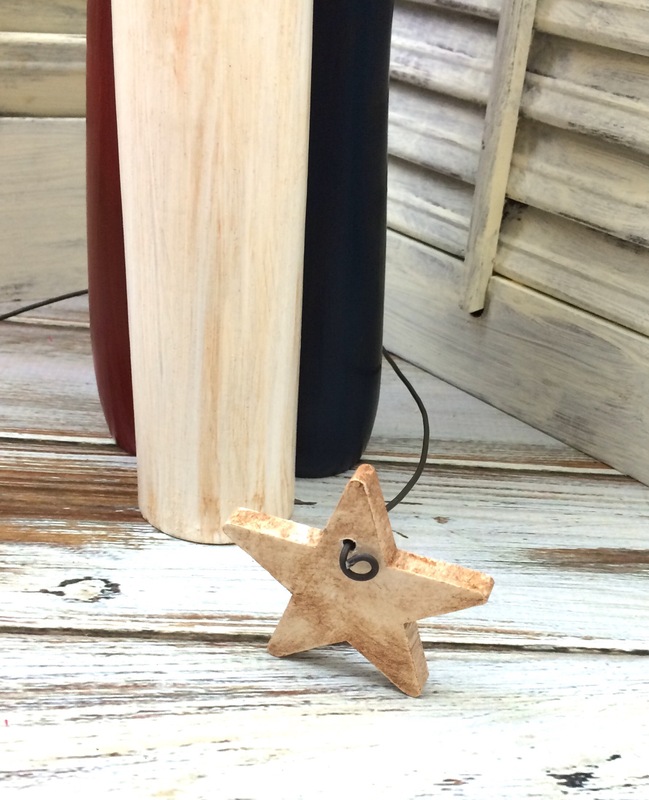 Using red, white, and blue paint stencil some stars onto your burlap strip. Twist the wire stars around the neck of the blue spindle firecracker, then cut three pieces of the July 4th wire thingy about 1 1/2″ long. Dap some wood glue on the end of each wire thingy and place in the hole on top of each spindle firecracker for the wick. 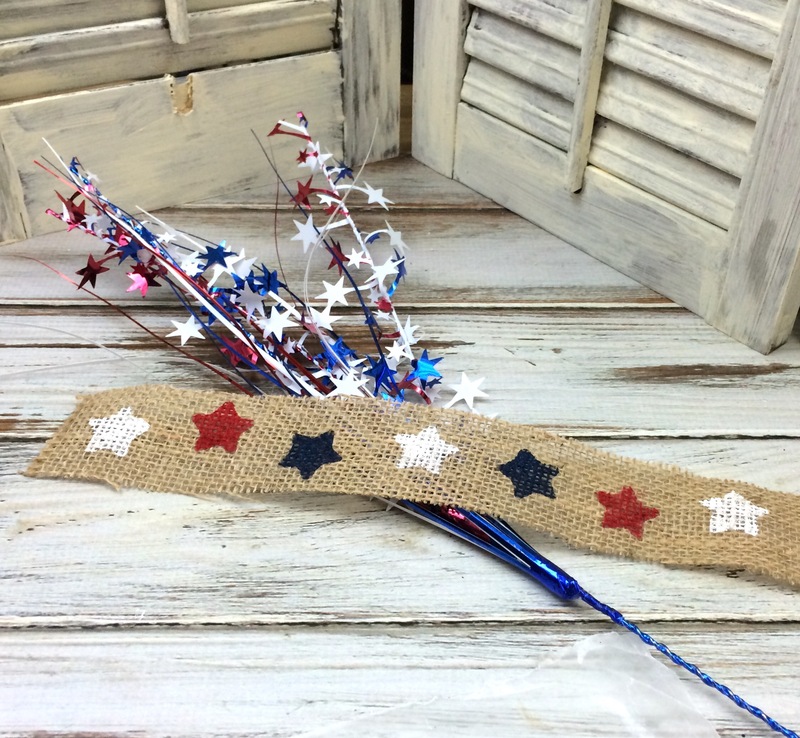 Use your hot glue gun to glue the star stenciled burlap strip around the July 4th spindle firecrackers. That’s it! 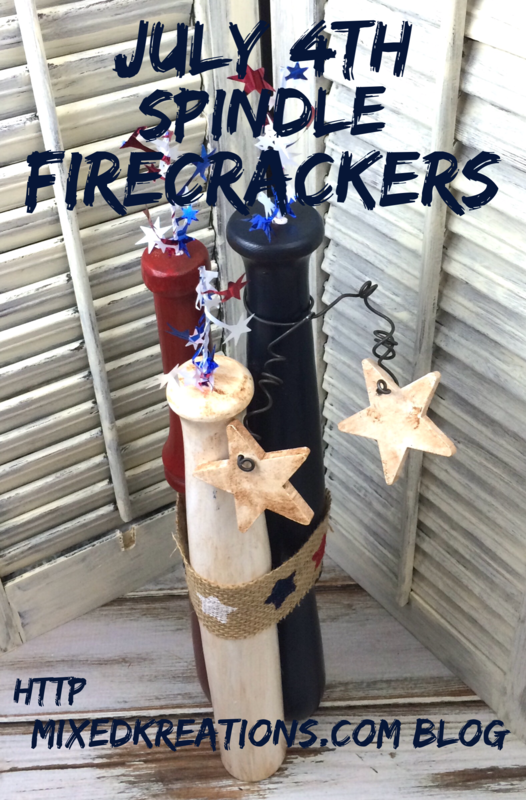 Very easy July 4th project that would look great sitting on a mantle, as the center piece for your July 4th BBQ, or you could even make a larger version of these spindle firecrackers to display on your porch. and a July 4th wire star thingy for the firecracker wicks. Other Spindle Post You May Enjoy! I love those! I’m always looking for interesting ways to use old spindles and spools. Thanks Jacki! I got lucky and found a basket full of wood spindles at a garage sale. This was one of my first spindle projects. This is a very creative idea. I love the way they turned out. Thank you Carol! I was happy how they turned out too!